As we age, we stop producing collagen and our existing collagen begins to deplete. As if that wasn’t enough for our skin to stress about, many of us have enlarged pores, uneven skin tone, pigmentation, scars, fine lines, and wrinkles on the face, neck, and décolleté. The advanced Dermapen Microneedling treatment at Spa Radiance Medical addresses all of these concerns by triggering collagen production, and is highly effective for a wide range of ages, skin types, and conditions. Add on Platelet Rich Plasma (PRP) to help tighten, smooth, improve skin tone, and speed the healing process. Or, opt for hyaluronic acid serum with your microneedling treatment to help restore lost volume. Our expert nurses will help you come up with the ideal treatment plan, though they usually recommend 4-6 sessions 1x a month for maximum results. Expert Tip: Our nurses rave they see the best results by far when patients complement their microneedling session with PRP. It is best to avoid the use of makeup or other products, with the exception of anything recommended by your provider, for a minimum of 6 hours post treatment. Avoid sun by staying indoors or wearing a wide brimmed hat until all redness as subsided. For the 3 days post treatment, for product recommendations and instructions given by your provider, as it is important to avoid certain products and chemicals while the channels of the skin are so open. We highly recommend using freshly washed bedding and/or pillowcases to avoid contamination of the treated areas post treatment. While some benefits may be noticeable after one treatment, for best results we do recommend that this treatment be done in a series. Our recommended treatment series consists of monthly Micro Needling for six to eight months. Once desired results have been achieved, we recommend maintenance treatments to be completed every 3 months. Micro Needling is a cordless surgical steel wand outfitted with pulsing fractional microthin needles. The trained Nurse or Medical Esthetician gently guides the Micro Needling device in long strokes over the skin, completely covering the treatment area. The microthin needles penetrate the skin to create microscopic “injuries” and channels which cause the skin to immediately activate production of healing collagen and elastin. 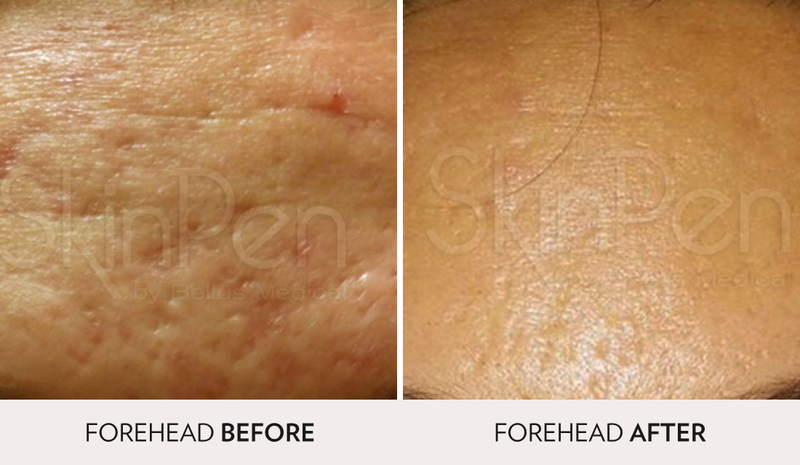 The treatment finishes with application of a soothing, healing gel rich in growth factors. Micro Needling treatments are ideal for all skin types looking to stimulate firmer, brighter, and more even skin on the face, neck, and décolleté. This treatment can help with uneven skin tone and pigmentation, acne or traumatic scarring, fine lines and wrinkles, dull, dehydrated, damaged skin, aging skin, and minimizing enlarged pores. Over the course of a few days, the surface layer of skin is naturally sloughed off by the new layer coming to the surface, looking softer and firmer. Visible changes to the skin occur over the course of several weeks. Micro Needling results emerge up to six months after treatment, as collagen production continues. Micro Needling is widely used in Europe. It is regarded as a safe and effective way to stimulate new skin without the use of lasers or chemicals. Clients who have considered lasers or dermal rollers will find Micro Needling to be an excellent alternative. Some mild discomfort can be experienced during the treatment but numbing cream can be provided and the device can be adjusted to suit an individual’s comfort level. After the treatment the skin will be red and flushed in appearance, similar to a moderate sunburn. You may experience skin tightness and mild sensitivity to touch in certain areas. This will diminish significantly within a few hours after the treatment. Within the next 24-48 hours the skins appearance will return back to normal. For some, flaking of the skin may be experienced a few days post treatment, this is just the old dead skin sloughing off revealing new healthy skin. Total healing time will depend on the emphasis of the treatment. What Does The Micro Needling Pen Do? Microneedling can be performed anywhere on the body. It is a minimally invasive procedure, performed in-office by a qualified, trained clinician. The Microneedling device is used primarily to help revitalize aging skin and soften acne scars. The tip of the pen holds a series of tiny surgical steel needles which pierce the skin. The depth is based on each patient’s specific skin condition. The needle cartridge is disposable, and the device itself is designed to minimize the risk of contamination. Micro needling triggers the skin’s natural healing response, resulting in healthy, glowing skin. Clinicians may apply a topical numbing agent prior to beginning the procedure, depending on the type of procedure that has been tailored to an individual’s skin. Most patients say their experience was virtually painless. There is minimal post-procedure reddening of the skin, which dissipates, so there is no downtime required. Microneedling procedures are brief, in office procedures, This procedure is gentler than most alternatives, so it may take more than one session to achieve optimal results. Results may become visible after the procedure. It is recommended that appointments are scheduled about a month apart, to give the skin time to rest and heal in between. 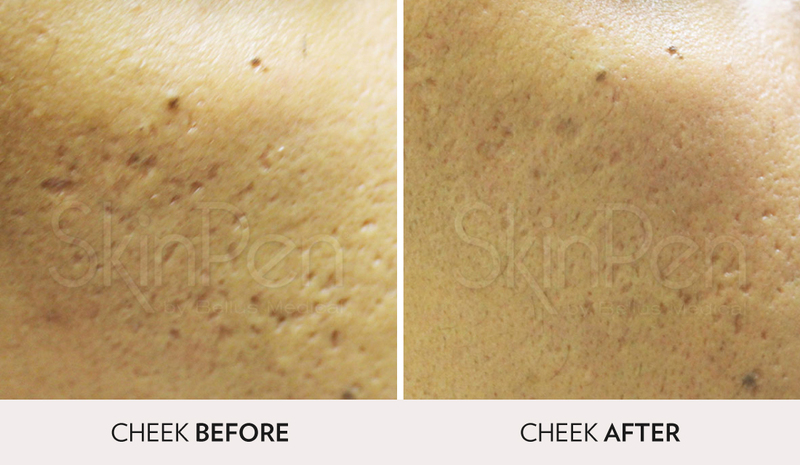 Unlike many other skin renewal options, micro needling is safe and effective for every skin color and type. It does not significantly affect the epidermis. When performed correctly by a trained clinician, there are is little risk of any side-effects such as burns, scarring, or hyperpigmentation or other discoloration. 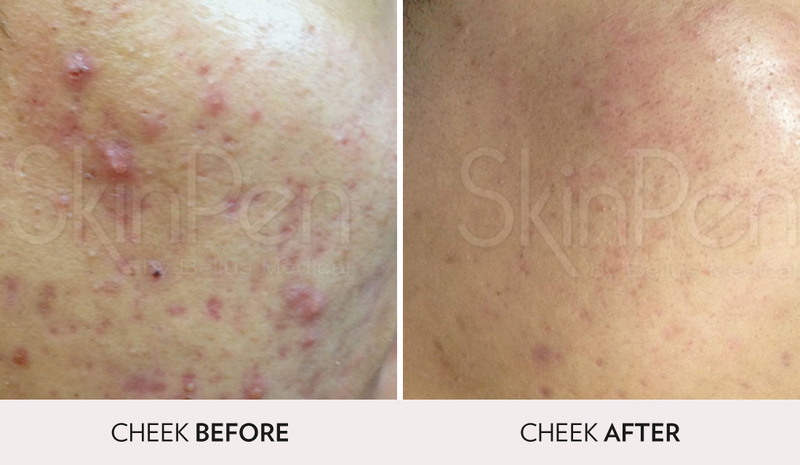 Microneedling offers another important advantage – post-procedure continuation. The procedure itself is part of a comprehensive system designed to produce maximum results and keep skin looking its best.